After the disappointement of my last Ultra I hatched a plan to try and do one more this year but to do it differently. This time I would do one but not tell anyone and more importantly do it on my own. 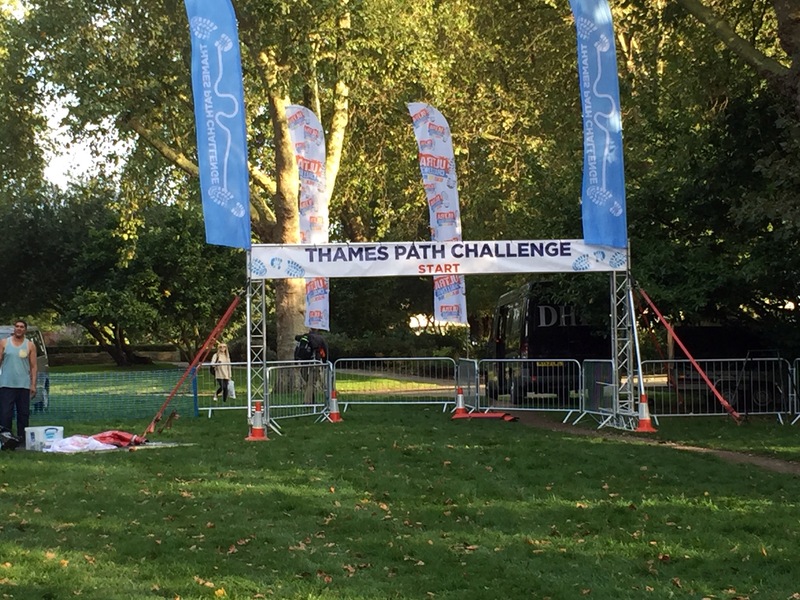 Therefore the day I went on holiday I secretly signed up to the Thames Path Ultra which had released some self funded places. The event was near where I worked and the finish only an hour from home. The course looked good and the reviews for the event OK. I went on my holidays with the family, camping in france, lots of exercise (camping is not a holiday!) and a few runs but more importantly got my mojo back. When we got back, withonly a couple of weeks until the race I thought I should tell my wife (a hotel booking on our credit card may have raised some questions). She thought I was mad but understood why and said she’d meet me at the finish BUT if I pulled out for any reason I had to find my own way home!!! The event itself started in Putney and, for me at least, finished in Runnymede as some were going on and doing 100k. Registration on the Friday evening was uneventful, nice staff, quick and easy and I spent the evening carb loading and watching Vinci beat Serena in the US Open – what a game! My start time was 7:30 so got there for 7, grabbed a coffee and waited in the pen for the get go. Whilst I appreciate some people like a gee up in the morning I do wish the compere guy and the warm up gym instructor had mute buttons! The race itself was good, cool weather with a few sunny spots and I had heard people say that Thames was always busy and not really understood it until race day. For the time I was out there activity on the Thames never stopped. Rowing boats, canoes, sailing boats, narrow boats, trading etc. 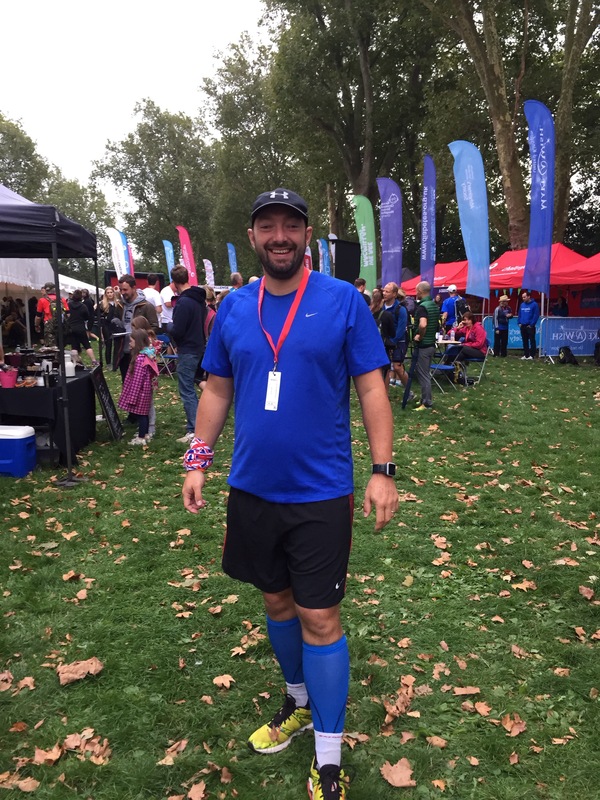 On the waterside I ran through 3 village fairs, one was playing God Save the Queen – are you supposed to stop or carry on running? A demonstration collecting signatures (I signed as they were offerring Jelly babies). My race went well, I ran the first 14k with a lady called Andrea who kept our pace slow and steady, skipped the first checkpoint to keep the momentum going and got through to 28k (checkpoint 2) in need of food and water. After the first checkpoint my normal nutrition plan (that I’ve used for years) just didn’t work and I couldn’t stomach it.. My normal combo of SIS tablets, flapjacks, gels and a fruit and nut bar just would not go down. Therefore at 28k and checkpoint 2 I took a bit longer and refuelled with the large supply of food provided and about 8 cups of water. The next cp was only 9k away so mentally I didn’t give it the respect it deserved and struggled through the 9k with a few wobbles. Interestingly looking at my average speed I didn’t drop much but mmentally had a wobble. At 37k was checkpoint 3 and by now I was really foused on the finish and seeing my wife and the kids. I ran walked until about 47 (walked the first.3 and ran the next .7km for each km), walked 47-48 and then ran the final 2k into the finish. 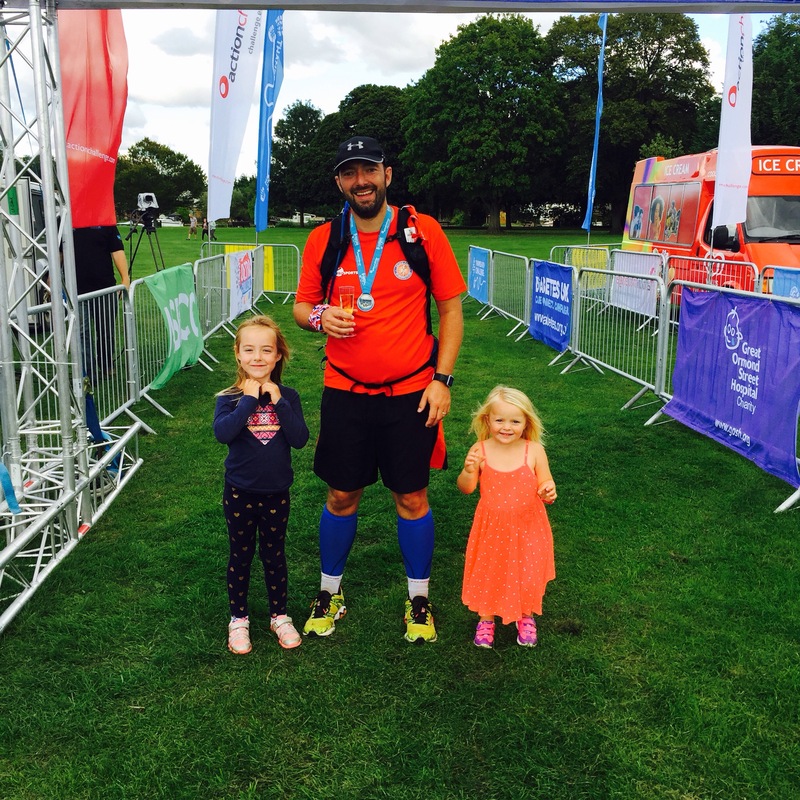 I finished feeling strong and was so pleased to see my wife and the girls. Even though the first comment from Amy on seeing me was “Daddy have you got some money to go on the trampolines!”. 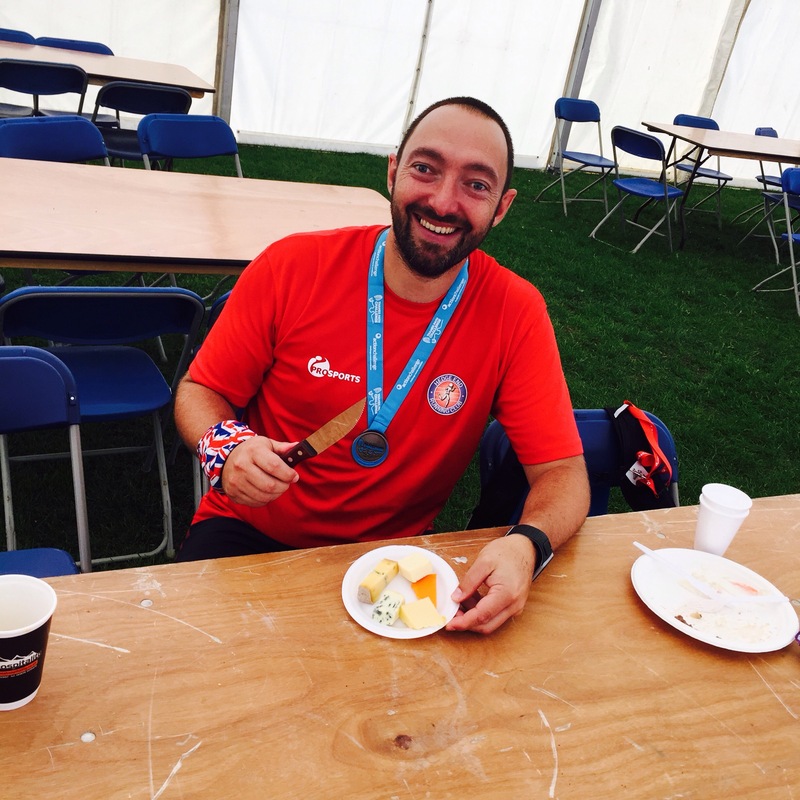 The finish was nice, glass of cava, medal and t-shirt followed by a hot meal and a CHEESE BOARD! Can’t tell you how excited that made me!!! But overall, I felt like I had put a couple of demons to bed. The 50km distance meant that although I was tired and things hurt I was able to go to the pub and celebrate that afternoon, take rugby coaching on the Sunday etc rather than after a 100km where I should really be put down! I would highly recommend this event to anyone else and the search for my next race continues!